The first day of autumn usually goes by without a weather change here in Texas. The middle of September is often still in the high 90's and humid. BUT, today is nice. It is in the low 70's and the breeze is wonderful. I watched the midday weather and it should be in the high 50's tonight...Yippee! Hayden is amazed with his pants. He always wears shorts, but today I have the windows open and the breeze is a bit chilly at times. He'll watch himself walk and then sit down to touch the pants that are so new to him. Get used to them buddy. Hopefully this FAB weather will stay with us for a while! 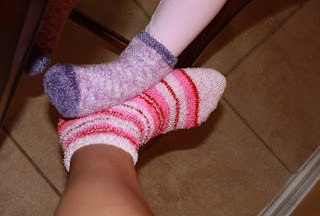 Layla and I busted out the fuzzy socks. Our toes are cold. I am so jealous! It has been windy here today but still hot! Ooh, I love the fuzzy socks! I love fuzzy socks! How cute is he fascinated with his pants! Today is supposed to be 98 with a low of 69 tonight! I guess that is better then 110! I am SO ready for it to start cooling down a little here too! If it would just not be quite so humid and muggy I would be happy though! This is me jealous of your weather! lol it was the upper 90s here today ugh. So funny about your little guy and his pants! He's probably like, "Why are these things following me everywhere I go!" haha! We are having cooler weather in Missouri and I am loving it. Trey use to be the same way as Hayden, stopping in amazement of pants. Fuzzy socks are a big hit here as well. Though I have only broke out the sweat pants right now. It is still 100 degrees here. Fall doesn't come until November. It is chilly here today!! I was shocked when I walked outside. I love your socks, so cute.